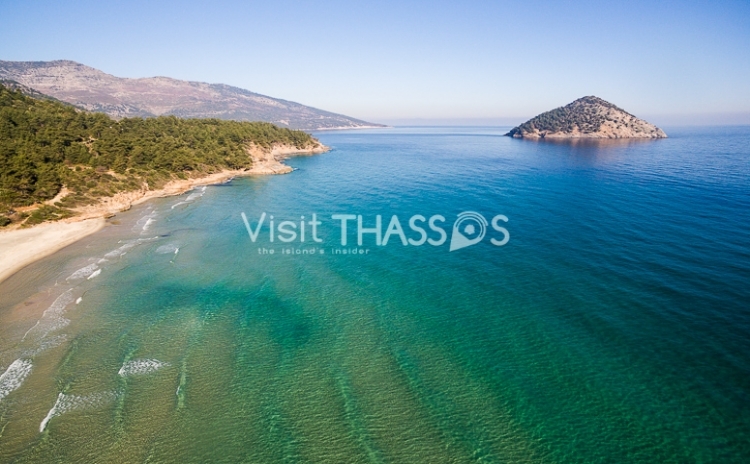 A few words about Paradise..
Paradise is a beach on the eastern coast of Thassos, on the way from Kinira to Aliki. The isolated bay which is surrounded by trees gives the visitor the sense that he is in an exotic place! Having been internationally distinguished for environmental reasons, it justifies its name. The sea colour is light green and several spots of the beach have rocks. Its crystal clear, shallow waters and the fine velvety sand will charm you and if you are lucky enough to witness the huge waves you will experience a taste of Hawaii! Paradise is an organised beach with sunbeds available for hire. There are also food canteens and a beach volley court. In the past, Paradise was the official nudist beach of Thassos, but lately, nudists take only a part of it. Access to the beach is via a narrow steep dirt road, which passes through a coppice that ends to a plateau right at the end of the shore offering parking spaces.